The Central Piedmont Search and Rescue (CPSAR) was the recipient of the Keeper of the Flame Award for 2013. Pictured here is the Concord High School Fire Academy Fall Semester Recruit photo from November 2012. WILKES COUNTY – A Junior Firefighter with the Traphill Volunteer Fire Department in the Northeastern part of Wilkes County took the opportunity to help multiple agencies when he set out to complete his Eagle Scout Project. CHARLOTTE – Charlotte Firefighters responded to an overturned fuel tanker truck on March 9th, 2013. 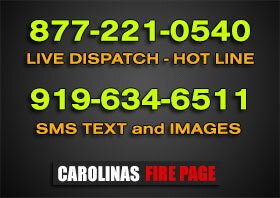 JOHNSTON COUNTY – At 08:53 hours on March 9th, crews from Four Oaks Fire and Four Oaks EMS responded to an explosion and fire at 4680 US Highway 301 South in Four Oaks. CALABASH – A fire destroyed a Calabash strip mall early Monday, according to authorities. GREENSBORO – A four-alarm fire broke out Thursday night at an apartment building on West Lee Street near UNC-Greensboro. GASTON COUNTY – Firefighters from nine departments battled a two-alarm structure fire early Thursday morning in Gaston County.